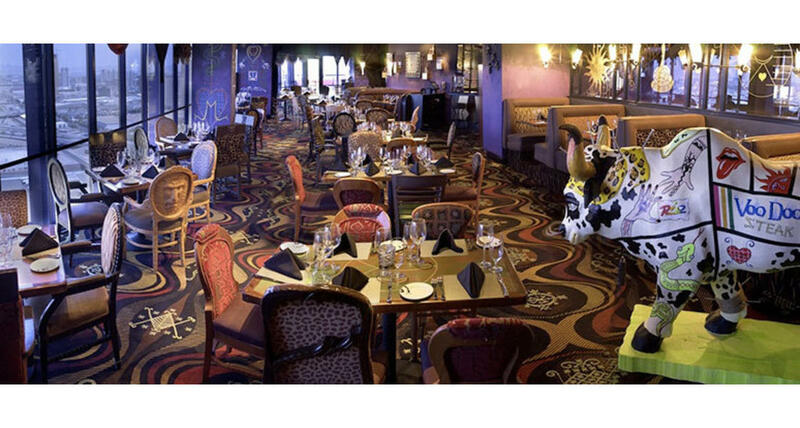 At VooDoo Steakhouse guests may enjoy the menu filled with delicious appetizers, succulent steaks and mouth-watering desserts as they take in the breathtaking view of the Vegas strip.Featured steaks on the new menu include the 24oz. Dry Aged Porterhouse and the 10oz. Wagyu Flat Iron Steak with thyme and butter basted crisp apple wood smoked bacon. For those interested in seafood and steak, the VooDoo Menage et Trois features a 6oz. Filet Mignon, a half cold water lobster tail and grilled Mexican white prawns.